bring 1 cup orange juice to a boil in a small saucepan over medium-high heat; cook until reduced to 1/4 cup (about 10 minutes). Remove from heat; cool completely. Stir in 1 tablespoon cilantro and next 7 ingredients (through red pepper); set aside. Place couscous in a large nonstick skillet over medium-high heat; cook 3 minutes or until toasted, stirring constantly. Add 1 1/2 cups broth, 1/2 cup orange juice, and 1/2 teaspoon salt; bring to a boil. Remove from heat; cover and let stand 5 minutes. Fluff with a fork; add onions, almonds, and butter, stirring until butter melts. Keep warm. Combine shrimp and egg white in a large bowl, tossing to coat. Combine the panko, 1 teaspoon cilantro, 1/2 teaspoon ginger and black pepper in a large zip-top plastic bag. Add shrimp to the bag, and seal and shake to coat. Heat oil in a large nonyick skillet over medium-high heat; arrange shrimp in a single layer in pan. Cook for 2 minutes on each side or until done. 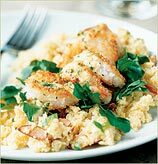 Place 3/4 cup of couscous on each of 4 plates; top each with 1/2 cup watercress and 5 shrimp. Drizzle each with 1-1/2 tablespoons sauce. Enjoy.